While Kid Icarus: Uprising is far from the most intelligent, thought-provoking game in the world, it is still a subversive, irreverent one – constantly wearing its heritage on its sleeve – a lovingly put together ode to Nintendo’s golden, videogaming past, and its bright, innovative future. Nintendo have always had a history of packaging solid video gaming experiences in deceptively cute and cuddly veneers; from the original Super Mario Bros. way back in 1985 to more recent ventures such as the innovative and surprisingly fresh Pikmin, no company has been guiltier of producing gaming wolves dressed up as unassuming sheep. 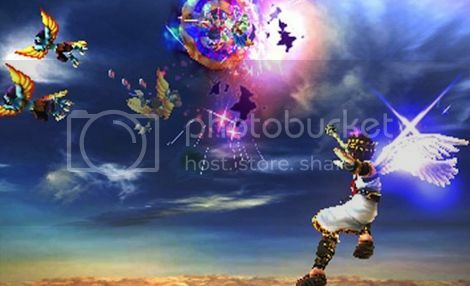 Kid Icarus: Uprising, with its bright, cartoony box art and angelic hero, appears to be the epitome of this. A suspicion that’s seemingly confirmed when you consider the game’s predecessors. It’s a direct sequel to the 1986 NES game Kid Icarus (and the 1991 Game Boy follow-up Kid Icarus: Of Myths and Monsters), one of the most devious, fiendish platformers of the late 1980s – a tough pedigree to follow. Nintendo, however, have always had a reputation for sidestepping expectations, and Uprising appears to be no different. From the off it’s a completely divergent experience for anyone hoping for something even remotely akin to past entries in the series. 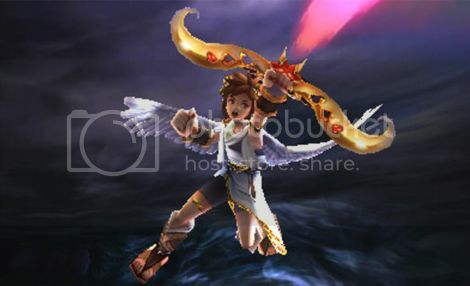 As the game’s protagonist, Pit, a clumsy and comedic angel who serves the goddess Palutena, you are immediately thrown into the action; taking to the air, fighting numerous members of the evil Underworld Army armed with a host of shooting and fighting equipment, and meeting its commander Medusa (the first game’s primary antagonist). It’s at this point you begin to realise just how swiftly the series’ approach has been shaken up on Uprising. In place of the previous games’ 2D side-scrolling, you now face gorgeous 3D flying sequences, huge open worlds to explore on the ground and enormous bosses that make previous equivalents look like cheap bundles of sprites. That’s not to say Uprising has forgotten its roots though; the retro charm of its predecessors are, in fact, referenced throughout. As characters are introduced, their original 1986 forms are shown on the 3DS’ bottom screen, certain levels are designed to appear dated and computer-generated and some enemies even produce the same sounds as they did in the NES Kid Icarus. These elements, combined with the fact the game’s fourth wall is constantly broken, create something a little more quirky and subversive than your ordinary shooting game. But, how does it actually play? Surprisingly well, you’ll be glad to hear; Nintendo have introduced an innovative control scheme whereby you simply steer using the circle pad, shoot by pressing L and aim using the touch screen and stylus. It’s a joy to behold. During the game’s early stages, things may seem more difficult than they are though. You’ll likely feel as if a million and one things are happening at once and, at first, you’ll probably have no idea what’s going on. Persevere, and Uprising’s many wonderful intricacies will begin to make sense and work together to form a well-rounded game. Even if later stages may leave you decrying Nintendo’s decision to make such a touch screen oriented adventure (particularly annoying when you must employ countless stylus manoeuvres rather than merely mash buttons). Any minor niggles fail to detract from the graceful soaring and swooping of Uprising’s airborne combat, however. These on-rails sections combine compulsively addictive playability with solid gameplay mechanics and are the real heart of this game. It’s not to say that the land-based portions of the adventure are bad, – they’re still enjoyable in their own right – they are merely eclipsed by the game’s aerial elements. Uprising does suffer one rather serious flaw though; it employs too rigid a dichotomy between its land and air sections. For two thirds of the game, each level follows a formulaic structure of ‘skyward combat, land combat, boss,’ and this grows tedious to say the least. You’ll find yourself longing for a more fluid, story-oriented structure to really feel immersed in the game’s strange combination of ancient Greek and sci-fi cultures. But, what a story it is. It boasts a cast of characters ranging from the loveable (Palutena) to the laughable (Pit). The game’s antagonists are equally charismatic, too; Thanatos is as bizarre and camp an adversary as you could wish to encounter, while the cultured, dry wit of Hades is equally amusing. The fact that you find yourself so emotionally invested in Uprising’s many heroes and villains is testament to Nintendo’s rarely trumped ability for timeless, evocative and involving character development. With the game’s primary plotline being equally engaging, it all adds up to a tale that sits right up there with Nintendo’s hallmark franchises The Legend of Zelda and Mario. It’s a narrative that will help see the initial completion of the game’s story mode fly by, while added incentives to complete it again such as improved weapons and collectible figurines make for a wealth of replay value. And, it will take you a while to eek this game for all its re-playability – its excruciating higher difficulties will see to that! While Kid Icarus: Uprising is far from the most intelligent, thought-provoking game in the world, it is still a subversive, irreverent one – constantly wearing its heritage on its sleeve – a lovingly put together ode to Nintendo’s golden, videogaming past, and its bright, innovative future. More importantly, it also marks a much-needed return to the solid gameplay that the company has so often lacked in some of its less substantial, more gimmick-oriented recent efforts. And for that alone, it’s an essential purchase for anyone with even a fleeting love for Nintendo, Kid Icarus or shooting and platforming games in general.